Ms. Holt is largely responsible for the ballet’s choreography, but she was delighted to collaborate with Lynn Bryson Pittenger on certain sections of the ballet, very much including the delivery of the final scene: Thumbelina’s arrival at the Vale of the Fairies. This is the scene in which Holt plans to create the essence of a fairy world. Thanks to donations and volunteer contributions of work and materials, the sets will indeed include ten foot tall flowers, some five foot toadstools, and the famous tulip from which Thumbelina is born—which will actually open its petals to release her onto the stage. 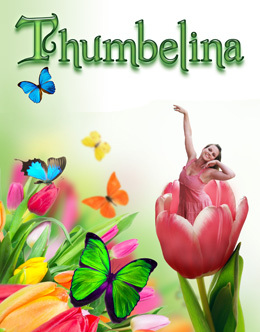 “The story of Thumbelina is certainly a child’s fairy tale,” maintains Holt. “However, through quality music, choreography and dancing, it can be told with depth and emotion so adults can appreciate it as well.” With a melding of contemporary dance, classical ballet and aerial arts, this performance is an excellent choice for the entire family.